Many of you have probably seen or heard of the movie Nacho Libre, and taken more interest in the Mexican wrestling sport better known as Lucha Libre because of it. However many of you may think that this movie is a huge over exaggeration of the actual sport. 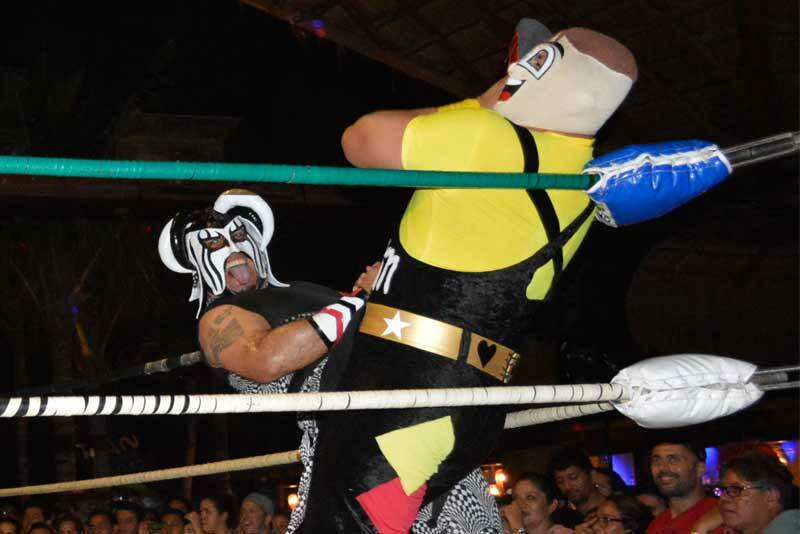 Well I recently attended a Lucha Libre event in Playa Del Carmen, and based on my experience I would have to say that the movie does a relatively thorough job of portraying what you can actually expect at a real life match. Yes the Luchador masks are very real, and the over descriptive acting is even realer. I was amazed at the crowd interaction, the heated crap talking battles, and the desire too truly entertain the guests. Given the opportunity I recommend attending an event like this as you can expect it to take your understanding of the Mexican wrestling game to a whole new level! On June 19th, around 10 pm I arrived at the Blue Parrot, a popular beach bar in Playa Del Carmen where the most recent Lucha Libre event was held. Security was on guard, and you could hear the rowdy crowd cheering from outside the gate. Right away I new I was in for a treat. As I passed through security my eyes were locked on the ring, anxiously anticipating my first glimpse of a real life Mexican wrestling mask and the villain to go with it. Needless to say I was not disappointed. As I approached the ring I was instantly surrounded by a heated, heavy drinking crowd that seemed just as angry at the wrestlers as they were at them. It was awesome! People were screaming at the top of their lungs, trying to get the attention of the wrestlers using every swear word in the Spanish dictionary. It felt like group therapy for an international conference of Tourette’s patients. Even the girls were joining the fun, making it easy to understand why these events are so popular. It was mayhem at its finest hour. After settling into the crowd you really become a part of the event. Perfect strangers were high fiving and chest bumping, in acceptance of the richest insults directed towards the performers in the ring. But make no mistake, the Luchadors are more than happy to fire back by pointing fingers, and flipping off the crowd to prove their villainous nature. I even witnessed one wrestler engage with a fan in the front of the crowd that was taunting him. Said fan “was” wearing a mask until the angry villain grabbed it from his head and threw it on the ground. But hey, you should be careful what you ask for or you just might get it. Of course this was all in good fun, and the fan was more than happy to be a part of the show. His buddies, for talking enough trash to get noticed, quickly gave him praise and the show continued. In the midst of all the excitement in the ring, there was also a very pumped up rock band called The Surfing Munsters playing in between each break on the stage located close by. 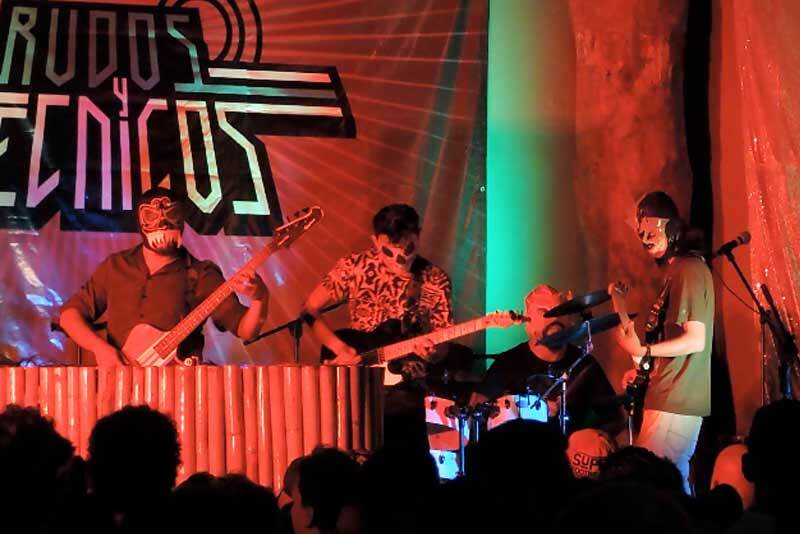 The band really set the mood, as all of them were also wearing Mexican wrestling masks, and bringing the same energy as the fighters. I will never forget this performance, it reminded of the scene from Tarantino’s “From Dusk til Dawn” movie. Ok, so the band wasn’t playing with body parts, but they were definitely a welcomed addition to the already awesome mood that the fight created. I hope these guys continue to see bigger and bigger stages, as this was a highlight for everyone during the breaks and after the match. Long live rock! Now when I first heard of these events I assumed this was strictly a man’s sport, but after attending this event I found out a better way to describe them is mannish. After the first couple of battles a team of tough women… ok really tough women entered the ring. They were not wearing lucha libre masks like most of the men, but they had some pretty outrageous black leather costumes on and the attitude to go with it. The crowd was chanting “Chichis pa la banda!,” I’ll let you google that one at your own discretion, but it definitely got the crowd the going. So at this point I’m thinking all right, here comes the all girl matches… yah… no. It turns out this was the girls about to put a beat down on some tough Mexican men in Lucha Libre costumes match. The following event was epic! After the girls entered the ring they quickly got the crowd fired up by jumping up on the corners of the ring and encouraging the fans to support them. It seems that the fans really took to the women, because at this point the crowd was going wild. It is something about the cross gender matches that make for a very entertaining show. However acting or not these girls could take a punch, literally. Just because they were women did not change the energy in the ring. If anything it might have increased it. A mix of blows being exchanged by the men and women, slick wrestling moves, and acrobatic tossing went on for at least 10 – 15 minutes thereafter, until the “shocking” win by a double pin victory happened simultaneously by the women. Fans were happy, especially the girls making this a very exciting end to a dramatic bout. So in closing my recommendation is this, when you come to Mexico plan a visit to Playa Del Carmen because the place is awesome! Aside from the beaches and beautiful weather, Blue Parrot often hosts events similar to this one including concerts and much more so catch up with there website and Facebook page to see what’s available during your trip. However most importantly if you have the option of attending a real life Lucha Libre event here, or anywhere for that matter, take it. It will be as memorable as your first shot of tequila. Get Your Lucha Libre Mask Delivered Internationally! I describe myself as a traveler, an educator, a creative, and a dreamer. I am also a co-founder of Wonderous World currently residing in Playa Del Carmen, Mexico. There is nothing that I love more than helping others enjoy the beauty's of Mexico, and the Riviera Maya. We will be in playa soon and have been looking for interesting activities. In addition to cooking class in Talum your article has opened up a great avenue for adventure not found at home. Thank you very much for an extraordinary article.